The customer service experience: Customer experience is a top priority - but are we doing enough? 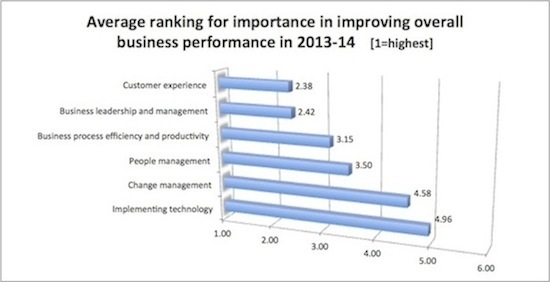 This survey built on the published results of a wider survey by Customer Management IQ into the Executive Top Priorities for 2013. We looked at the specifics of how business priorities would be met in practice and the progress organisations feel they’re making. All 26 respondents ranked six priorities in order of importance to improving their organisation’s overall business performance. Customer experience emerged narrowly ahead of business leadership and management, with technology featuring as the least important factor. 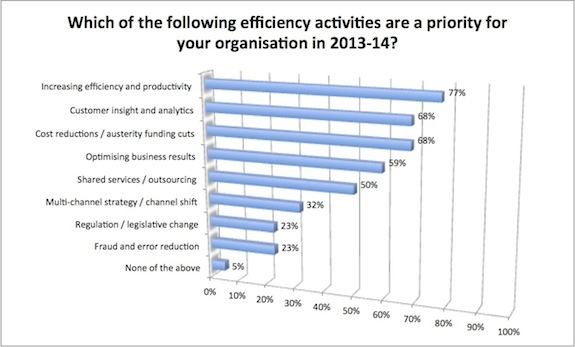 Interestingly, change management didn’t feature as a particularly high relative priority amongst our respondents. Is there a debate to be had about change management appearing as another buzzword or ‘consultancy fad’ whilst the discipline matures in the marketplace? A google search of ‘change management’ reveals 774 million hits, compared to ‘project management’ (undoubtedly a mature field) returning 594 million hits (as one snapshot measure of discussion). Is change management well understood? Is there a lack of understanding of what change management really means in practice, with the market filling itself with proprietary consultancy definitions and methodologies seeking to become a new standard? Perhaps this is a question worth posing in your next discussion with a vendor, candidate or consultant if you feel they use 'change management' as little more than a management buzzword. In practice, what are the 'change management' activities that will contribute to advancing your organisation’s priorities in improving customer experience and business productivity? Do the solutions they propose feel like they’ll stand up to the test of reality in your own organisation? These are all questions worthy of consideration in an emerging field which our respondents felt wasn't the highest priority on their list. 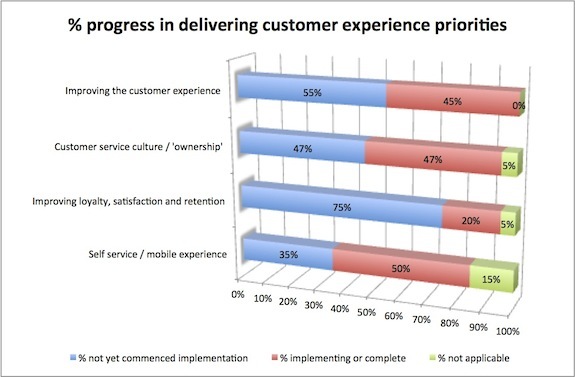 Customer experience – high priority, but where’s the activity? 20 respondents gave their views on the priority of four aspects within the customer experience theme. 85% of respondents cited improving the customers’ experience as their highest priority. This focus on the customers’ needs is a positive feature. In practical terms, this has implications for the use of techniques and tools such as customer journey analysis and value stream mapping. It also highlights the inherent value of using customer feedback, complaints analysis and ‘business intelligence’ or ‘customer insight’. This is a topic we’ll see recognised elsewhere in the results. How organisations choose to combine technology investment with employee experience and expertise in these areas can be a defining factor in the results of service improvement initiatives. What was interesting, given the recognition of customer experience as a priority, was that over half of our respondents haven’t started implementing any activity to make progress in this area yet. The summary results show the percentages selecting 1 to 4 (pre-implementation) and 5-6 (implementation in progress, or completed). Despite 60% of our respondents indicating that improving loyalty, satisfaction and retention is a priority, 75% have not yet begun implementation of measures to address this area. When does something that’s a business priority become important enough to demand action? We’ll see later on that pressures such as funding reductions have led to a greater degree of action (perhaps enforced?). Organisations may wish to consider what it takes to turn an important priority into tangible delivery action. Is a lack of action about the measures and the definition of benefits, or the fact that it’s hard to define a cause and effect chain behind ‘improved satisfaction’? When planning your own activities, it is worth considering how you’ll go about measuring, assessing and defining the benefits you’ll be expecting from your customer experience. 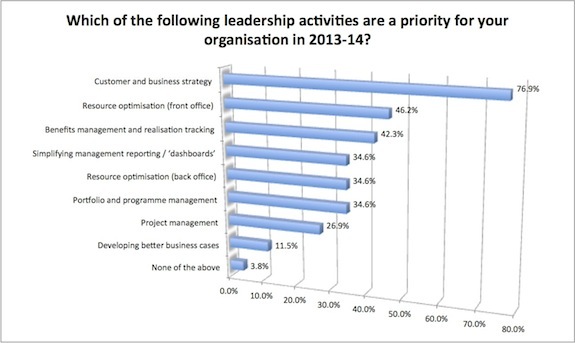 All 26 respondents gave us their view on the priority leadership activities for their organisations. Customer and business strategy clearly led this topic area, with a broad spread across other strategic activities including resource optimisation, benefits management / realisation and simplification of management reporting. 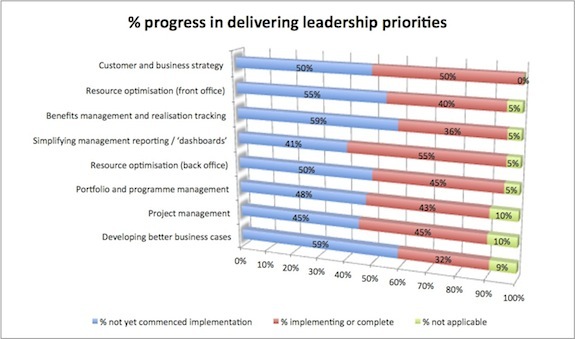 What was interesting in the follow up question on progress (completed by 22 respondents) was the lack of progress into implementation across these priorities. Respondents appear to be aware of, discussing and planning for changes in these areas but do not yet feel that their organisation has moved to implementation in roughly half the cases across all the category areas. Is this a case of more talk than action, even in some areas (such as project management) that have been well established now for decades? Are these topic areas really so hard to tackle that organisations aren’t able to make progress and become stalled during planning? Is the resource pressure caused by reductions in funding making it impossible to move beyond resource commitment into actual implementation? Customer and business strategy showed a clean 50/50 split with half our respondents indicating they have not yet begun to implement their strategies. This is a finding worth thinking about in your own organisations. Establishing a clear direction is well established as an essential pre-requisite to achieving successful business change. Leading thinkers such as John Kotter and Ken Blanchard (to name but two) have demonstrated the need for strategic direction in numerous articles. The importance of an effective customer strategy to guide the implementation stages of business change and technology initiatives cannot be understated. 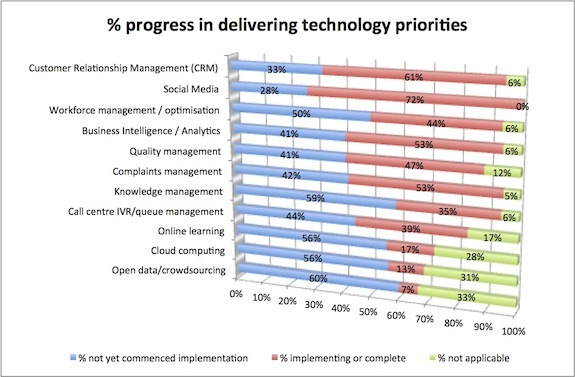 In another aspect of our survey, 19 respondents showed organisations are already making significant progress in activity to deliver on their perceived technology priorities. They’re clearly off building something. However, if half of our respondents aren’t yet convinced they’ve implemented their business and customer strategy, it does beg the question as to what precisely is being delivered by all this furious implementation activity and whether or not these efforts will lead to substantial re-work. Do we do it now, or do we do it right? This is a question continually posed by managers, and striking the balance between activity and planning is always a constant challenge. This question does remind me of a statement made at a conference by the Head of ICT at a leading UK London Local Authority about his organisation’s implementation of Customer Relationship Management (CRM). Having spent over £1 million on the implementation in previous years, it was revealing (and rather depressing, as a taxpayer) to hear a senior figure stating that “We’ve done it once, now we’re going to do it right." The need to think before we act, or risk the wastage of re-work is at the heart of another area that 22 respondents kindly shared their views on. 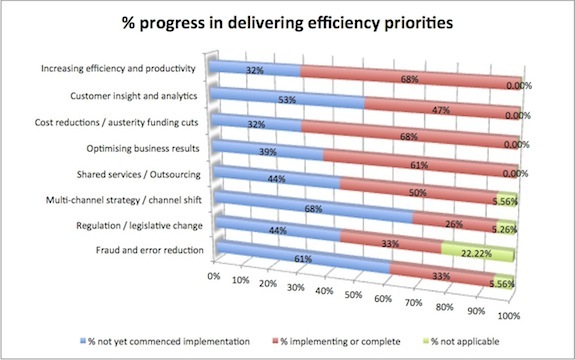 Business efficiency improvement emerged as the third highest priority area and we looked at a number of different aspects of this general theme. The results show a recognition of the cost reduction pressures, which is unsurprising given the public sector spread of at least one third of our respondents in the UK and New Zealand. The recognised value of customer insight and analytics is encouraging. The delivery of continuous improvement by learning from customer feedback has been long established in international standards such as ISO10002 (for complaint management). As with the technology results, substantial progress was reported in many of these areas. Interestingly, progress on delivering channel shift did not rate as highly as one might expect given the level of industry discussion about channel shift as a route to deliver efficiencies. Could this be a recognition that the promises of business cases have, in reality, not always delivered? Of course the very small sample size makes any extrapolation or speculation in this area difficult. However, it does provide a useful prompt for managers to throw out a question when looking for promises of channel shift efficiency. When evaluating your vendor’s business case, are their assumptions realistic and reflective of your experience and data about customer behaviour and intention? Will customers really move wholesale from one channel to another, or are you more likely to see them spread their contact over multiple channels requiring a resource commitment to both? Major UK public sector business transformation programmes have been the subject of critical audit reports that highlight over-optimistic promises of channel shift from technology vendors, leading to deeply flawed business case assumptions. What evidence does your organisation have for your customer’s behaviour being one of shift from one channel to another? Are you processes sufficiently well defined to avoid customer callback when aspects of your multi-channel strategy don’t quite hang together? Or are your broken processes going to prompt failure demand as customers contact you for assistance in navigating a multi-channel problem of your own making? The devil is in the detail. Again, we are back to the need for that well thought out customer strategy that you might not have got around to implementing just yet, in all the excitement of delivering your technology projects. The questions discussed here remain useful, despite the disappointingly small sample size. The results and discussions are presented with this caveat very clearly in mind. Caution should be taken in referring to these results, but you may find the discussion points useful in your own situation. The following information describes the distribution and breakdown of survey responses received. A link to the survey was publicised through global LinkedIn sites focused on customer service and in Twitter feeds focused on customer service (#custserv) and customer experience (#custexp) during February and March 2013. 19 of the 26 respondents chose to disclose their role titles, with just over half of respondents in a senior management or executive position. 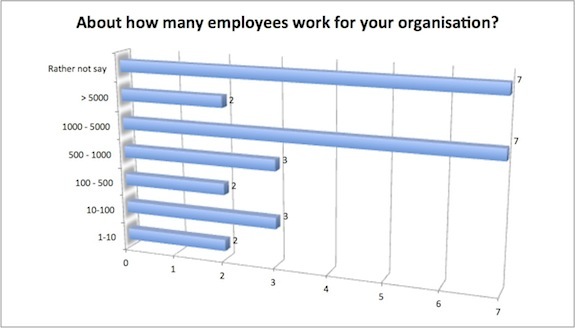 Responses were provided by some sizeable organisations, with over one third of respondents having more than 1000 employees in their organisation. Over one third of respondents were identified as being from the public sector, in central government, local government or healthcare. 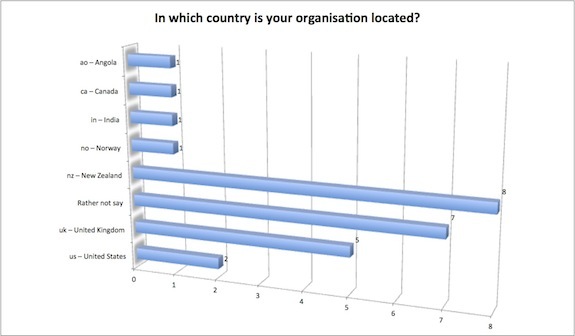 Half the responses came from New Zealand and the United Kingdom, with New Zealand being the single largest group of identified respondents (and mainly in the public sector).